130 mm/50 M1936 shì4 х 1 pcs. 180 Degree Turn Time30 sec. Initial HE Shell Velocity870 m./s. Initial AP Shell Velocity870 m./s. 533 mm 1-N2 х 3 pcs. 37 mm 70-K4 х 1 pcs. 37 mm 61 shì4 х 2 pcs. Fushun — Pan-Asian Tier VI destroyer. Soviet Gnevny-class destroyer Rezkiy (Резкий), that was transferred to the People's Republic of China Navy in 1954. She was fast and her main battery artillery was powerful enough for a ship of her type. Fushun is a destroyer that excels at mixed combat. Equipped with decent torpedoes, great guns, and good speed, she is able to flex around the battlefield with ease, and fight any number of targets. Captains who have played Anshan or Gnevny feel right at home in this destroyer. The guns perform as one might expect from a Russian built destroyer: good velocity, damage, and shell arcs. These traits — plus her Smoke Generator ( ) — allow the captain to fire away at enemy ships either from cover or open water. Captains should note the turret traverse speed of her guns. They have a slow turn rate of 6 degrees per second, making the Expert Marksman captain skill, almost a necessity. However the rest of her traits more than make up for the cons. Fushun’s torpedoes are the Pan-Asian standard deep water torpedoes. They have good range, damage, and speed, allowing the captain plenty of target options when it comes to firing them. Her AA is weak, and is the main weakness of the ship, so aircraft should be avoided at all costs. Her speed is great, putting her on par with some of the fastest at tier, the Sierra Mike ( ) signal flag can get it up to 39.9 knots. Excellent guns with good ballistics make shooting at range simple. Good torpedo range allows sneaky torpedo hits. Has good speed allowing quick getaways, or running down an enemy. Deep water torpedoes that are incapable of damaging destroyers. Slow turret traverse almost necessitating Expert Marksman. Inability of her torpedoes means knife fights are to be avoided. Hull: Upgrade to Hull (B) for more health, better anti-aircraft armament, and a slight improvement in rudder shift time. Research of this module unlocks progression to Gadjah Mada. Torpedoes: Upgraded torpedoes offer additional range in exchange for slightly less damage and a longer reload time. Gun Fire Control System: Upgrade to GFCS VI mod. 2 for an extra 10% range on the main battery. Hull (B) is the best option to sink early experience gains into. After that, invest in the torpedo upgrade for extra range. The GFCS upgrade can be saved for last. Slot 1: Main Armaments Modification 1 ( ) keeps the guns and torpedo tubes active and firing. Slot 2: Propulsion Modification 1 ( ) destroyers need their engines, this keeps it going longer. Slot 3: Aiming Systems Modification 1 ( ) decreases the dispersion and speeds up the torpedo tube traverse. Slot 4: Steering Gears Modification 2 ( ) speeds up the rudder shift allowing faster zig-zags. OR Propulsion Modification 2 ( ) for a quicker acceleration from a stop. Key skills for Fushun commanders include a standard destroyer core build with Priority Target, Last Stand, Demolition Expert, and Concealment Expert. From there the captains best option in skills to take a full gunnery focused build of Basic Firing Training, Advanced Firing Training, and Expert Marksman considering her close resemblance to the Gnevny or Anshan. 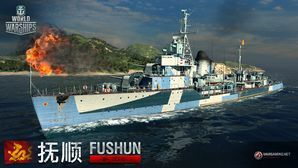 Players who wish to spend doubloons can equip Fushun with Type 16 camouflage that lowers her detection radius, reduces the accuracy of incoming shells, and increases the amount of experience she earns. A Russian-based destroyer with good firepower, Fushun makes good use of flags such as India X-Ray ( ), Victor Lima ( ) to up the fire chance of the guns, and the ever useful Sierra Mike ( ) to increase the top speed. Other useful signals include Juliet Charlie ( ), to keep the ship from exploding out from under the captain, and November Foxtrot ( ) for lowering the consumable recharge time. Standard economic signals like Equal Speed Charlie London ( ) and Zulu Hotel ( ) help speed up the ship's grind towards the Gadjah Mada , and earn more XP for the ship's captain. Fushun dumps torpedoes at the enemy. Fushun sails with an allied Aigle. Fushun stands with weapons the ready. Rezkiy now renamed to Fushun at anchor in her final configuration. Rezkiy in her Russian service. This page was last modified on 24 April 2018, at 23:43. This page has been accessed 27,902 times.